Las Rutas de México/The Routes of Mexico | ¡VidaMaz! Have you seen the full splendor that Mexico has to offer? It’s an incredibly beautiful, historically and culturally rich, and geographically diverse country populated by some of the kindest people on the planet. Yes, I am very proud of my adopted home. I’ve been privileged to live in four incredible countries in my life (Japan, Spain, USA and Mexico). Our planet definitely holds beauty! 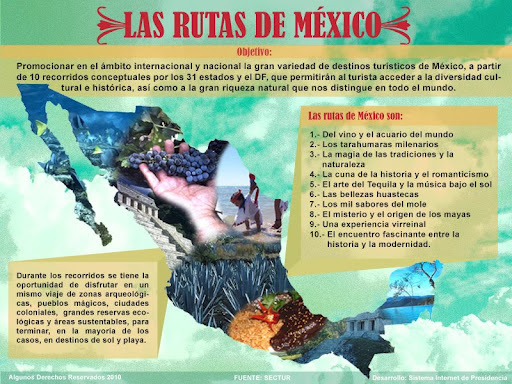 Today, May 22 2010, President Felipe Calderón announced a new Sectur tourism program, called “Las Rutas de Mexico.” How many of these routes have you travelled? 1. Route one is the route of the Culture of Wine and the Aquarium of the World, based in the states of Baja California and Baja California del Sur. My cousins and I are planning a trip there this next October, in celebration of our 50th birthdays. 2. Route 2 is the Millenary Route of the Tarahumaras, which passes through the states of Chihuahua and Sinaloa. This is the route we took during Holy Week and Easter Week last year, and includes El Chepe train through the Copper Canyon. It was incredible, and the culture of the Tarahumara (indigenous people) is fascinating (they are the famous distance runners). 3. Route 3 is the Magic of Tradition and Nature, and runs through the states of Mexico, Michoacan, Morelos and Guerrero. There is a LOT of diversity to see here. We’ve seen some of it, but look forward to seeing a lot more, including the wintering grounds of the monarch butterflies. 5. Route 5 is called the Art of Tequila and Music Under the Sun, and traverses the three states of Jalisco, Nayarit and Colima. 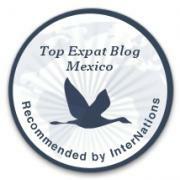 We visited the towns surrounding Tequila over Christmas break a year ago, and it is definitely worth the trip! 6. The sixth route is called Huastecan Beauties, through the states of Hidalgo, San Luis Potosí, Tamaulipas and Veracruz. We have not traveled this area yet, and very much look forward to it. 7. Route 7 is the Thousand Flavors of Mole. Again, who could resist that? This route includes the states of Tlaxcala, Puebla and Oaxaca. We spent this past Christmas in the city of Oaxaca and, believe me, it is gorgeous and we ate terrific mole! 8. Route 8 is the Mystery and Origins of the Mayans<, and traverses the southeast of Mexico. The amazing architectural feats of the Mayans are definitely one of the world’s treasures. 9. Route 9 is the Experience of the Viceroys, through the states of Zacatecas, San Luis Potosí, Aguascalientes, Guanajuato and Jalisco. 10. The tenth route is called the Fascinating Meeting of History and Modernity. It is located through the states of Durango, Coahuila, Nuevo León and Sonora, where the juxtaposition of ancient and modern is as remarkable though very different than similar juxtapositions in Asia or Europe.